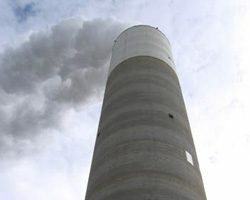 The coal industry hopes the federal government will help them find a way to catch and store the carbon coming from smokestacks. The last time the federal government put a price on coal pollution was in 1990. Power plants had to start paying for sulphur dioxide that came out of smoke stacks and caused acid rain. To clean up, many burned cleaner coal. That was bad news for Illinois miner Chris Nielsen. He happened to mine some of the dirtiest coal. Cleanup technology improved, but it took nearly two decades to make burning the highest-sulpher coal economical again. Nielsen says today, coal executives worry they’ll lose profits if the government prices carbon dioxide. And coal miners worry they’ll lose jobs again. The industry wants new plants that do two things: first, they capture carbon dioxide while burning coal, and then bury, or sequester this carbon dioxide – so it stays out of the atmosphere. Nielsen says there’s a plant like that in the works, it’s called FutureGen. Well, Nielsen’s jumping the gun. FutureGen hasn’t proved anything; it’s not even built. The coal industry and the government were supposed to design and fund FutureGen, then build it in Central Illinois. The government and coal companies fought over how much the plant would cost but now, it’s likely to move forward. Even with a sketchy history though, the industry’s got almost no choice but to be hopeful for FutureGen. The industry wants carbon dioxide capture and sequestration to work – otherwise, it’s gonna pay big for carbon pollution. Not everyone’s so confident in the technology. That’s Ron Burke, with the Union of Concerned Scientists. He says FutureGen is worth testing but it shouldn’t distract us from technology we know is low-carbon. There’re energy researchers who aren’t so sure enough renewable energy like wind and solar will be available soon enough. One is of them is Ernest Moniz at MIT. Coal generates nearly half our electricity. Moniz says it won’t be easy to replace, but it might be possible to improve it. He says its likely carbon dioxide capture and sequestration can work technically. But he says we need to build FutureGen to answer whether it works efficiently and economically. For Moniz, FutureGen could be clean coal’s first major test – not just of whether it works – but whether it’s too expensive.